To switch temperature display between Celsius?? ?and Fahrenheit?? ?, please hold down ionic and power button at the same time for 3 seconds. 1. Level 1,around 150??300? ?, suitable for first time user or user with thin and fine hair, or bleaches hair. 2. Level 2, around 170??340? ?, suitable for dyed or dark color hair. 3. Level 3, around 190??380? ?to 210??410? ?, suitable for normal or slightly curled hair. 4. Level 5, around 230??450? ?, suitable for thick and very curly hair, or difficult to style hair. ?For the first time usage of the appliance, occasionally there may be a slight burning smell or very light smoke, which is caused by the slight residual oil on the PTC heater metal parts burning off when heated. This is normal and safe to use. This may only last for a few seconds. ?It is important to set appropriate working temperature before using it in order to prevent your hair get dry or damaged. ?When the PTC heater is on, the brush can get extremely hot, make sure you are keeping it away from eyes,nose,hands,neck and facial areas. ?Unplug the appliance and allow to cool. ?Wipe all the surfaces with a damp cloth. ?Do not use harsh or abrasive cleaning agents or solvents. ?Store the appliance in dry and cool place. 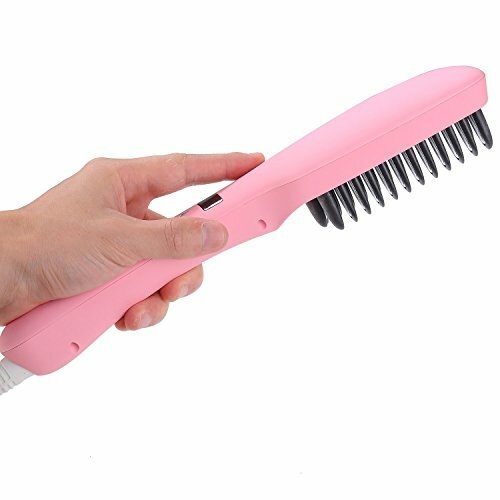 Super Rapid Heating Instant heating in less than one minute, Comb tooth top and around adopts anti static ceramic design, which ensure the comb tooth surface smooth and constant temperature.With double anion spray, it can maximize the styling effect of smooth, shining and elegant after using. 5-Speed Thermostat Design Set to desired temperature using the built in LED screen and begin brushing. Temperature settings range from 150? for straighter, finer hair to 230? for thick and curly hair. faster take care of hai Merge the ceramic iron straightener, detangling brush, anion hair massager together, gives you a comfortable and safe experience during straighten your hair. Improved parallel bristles design makes our straightener brush work well with thick & long curly hair. Built-in Ionizer Anion density up to 6000000 pcs/cm³. Negative ions can neutralize the positive charge to reduce the static frizz static electricity, bifurcation and tie. Reproduce smooth shine charming hair more fashion and more comfortable. 360°rotatable tail keep the line shapely, make brushing more convenient.